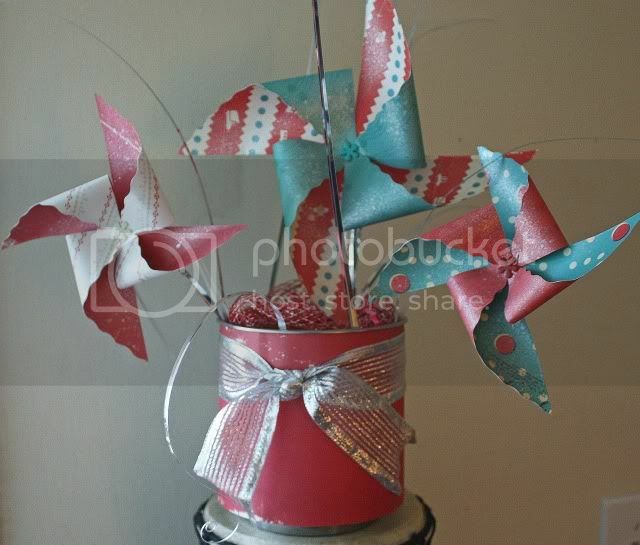 I wanted to add a little pizazz to my pinwheels, so I spritzed them with Baby's Breath shimmering spritz. Baby's Breath dries with a silver sheen which was perfect for coordinating with the silver ribbon and onion spray used in my centerpiece. This product is so awesome because you can literally add it to ANY project, it's that easy to use! If you haven't tried shimmerz yet, stop by the shop and pick some up but be careful, they are addictive! Click here for full instructions to create this project. OH MY GOODNESS!!! This is so fantastic! I would be more than happy to take that centerpiece off your hands :D Gorgeous!! !